Denise gives rosemary to visitor. Simpson’s Fall Open House took place on a warm, sunny late September Sunday with the asters and goldenrod in full bloom. We offered tours of the garden, with explanations of its history and the various beds and their purposes and seasonal strengths. 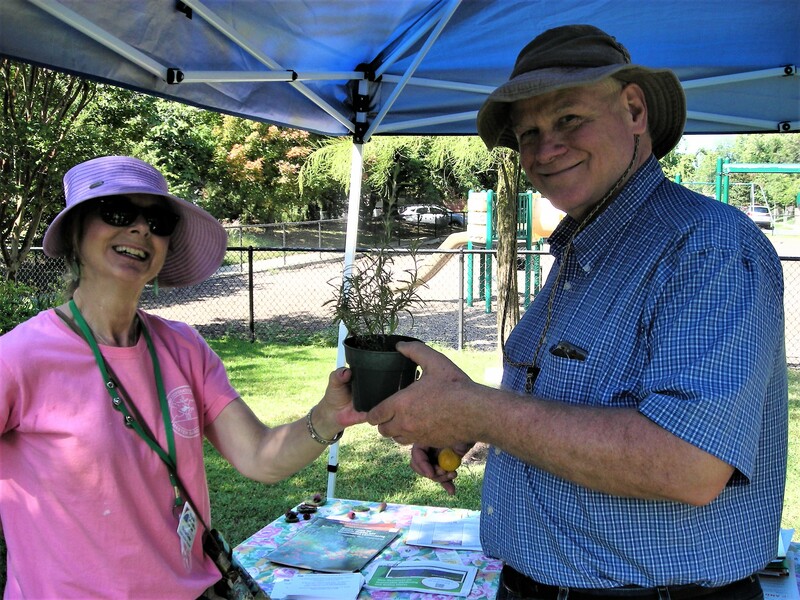 Along with informational handouts and refreshments, we gave away small rosemary plants propagated by one of our gardeners. Audubon at Home Ambassador Mary Nell Bryant offered information to visitors interested in having their home gardens certified as Audubon Wildlife habitats and shared ways to make home gardens more hospitable to birds, bees, butterflies, and other pollinators, as well as other desirable wildlife. The new kiosk at Simpson Gardens. We’ve had a good year at Simpson. 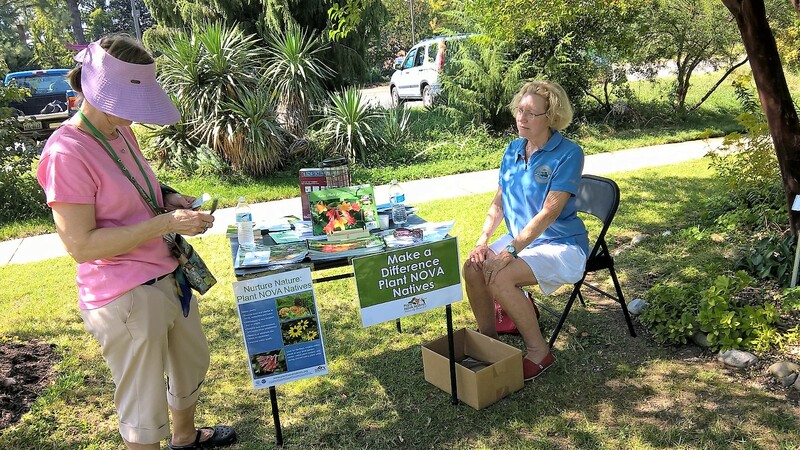 Local gardeners have stopped by our monthly strolls to gain gardening tips and advice for specific projects or problems. 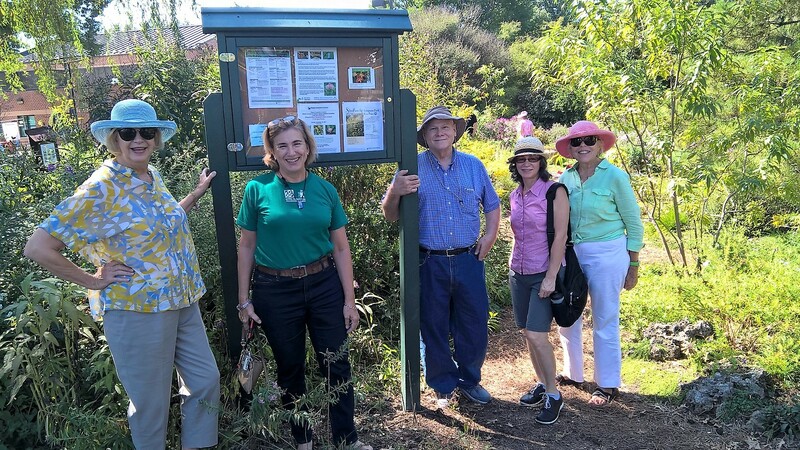 The City of Alexandria provided us with a handsome new kiosk where we can post information about plants and events, and we have redone some of the little boxes where we keep plant lists for the various beds. Beth Tindal tidies up the willow trimmings from the butterfly garden. We’ve added one bird bath and improved another and posted one of those nice signs from the Extension office that explains that this garden is tended by Master Gardener volunteers. 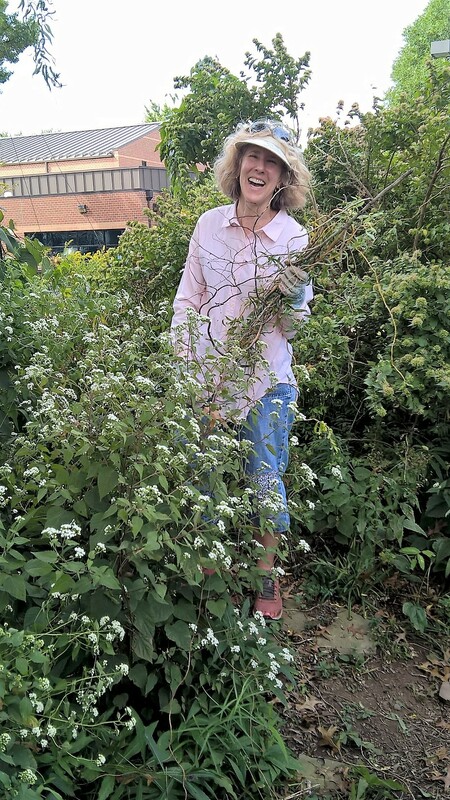 We continued our efforts to improve the shade garden and are renovating the butterfly garden, taking out some plants that have overgrown their space and replacing them with others that have more suitable growth habits. We plan to add winterberry holly, another source of winter food for the birds. On another front, we are updating our plant lists. Right now there are masses of asters and late blooming red salvias and a whole lot of pollinators humming in every available flower clump, not to mention the birds singing their hearts out as they swoop from tree to shrub to water source. The colchicum are almost finished, but put on a great show this year with their surprising clusters of leafless pink blooms. We welcome all Master Gardeners and interns to join our Tuesday work parties from 10 a.m. to 12 p.m., or just come by to see what’s going on as each season rotates through the year’s blooms. This entry was posted in Simpson Gardens. Bookmark the permalink.